Looking for Annapolis slab leak repair technicians? Contact Heidler, Inc. to work with the experts who have been solving the toughest plumbing problems for over 65 years. Call us today at (410) 268-7191 for immediate solutions. Click here to view our current specials and discounts. Most slab foundations have a system of pipes that carry fresh water into the home while directing wastewater away. Just as other pipes on your property can develop leaks, the same holds true for the pipes in your slab. 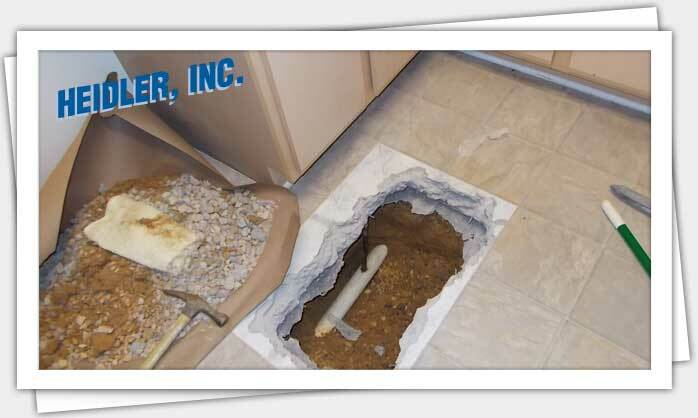 Your Annapolis slab leak repair team at Heidler, Inc. is ready to handle this urgent plumbing issue. See how we have helped your neighbors—click here to read our latest customer reviews. Because slab leaks are hidden from view it’s important to be aware of the problem signs. Slab leaks are caused by many of the same factors that create leaks in other pipes around your property. Freezing: While your outdoor pipes may be well-insulated from freezing temperatures, extreme conditions can still cause the water in your slab foundation’s pipes to freeze and lead the pipes to rupture. Shifting ground: When the ground beneath your home settles, the foundation itself may shift. This slight movement may be enough to damage the pipes and create a leak. Wear and tear: Normal wear and tear or deterioration related to age may also cause damage to pipes in your slab. What are signs you have a leak? Wet spots: If the leak is located near the top of the foundation, you may notice wet spots on your floor. Drop in water pressure: Significant leaking can lead to a decrease in water pressure. Higher water bill: Whether the leak is minor or significant, your water bill will increase. Warm spots: If a hot water line is leaking, you may notice that your floor feels warmer in one area compared to other areas of your home. Slab leaks are often found on the lower level of your home, such as the garage. The leaks may be difficult to detect, and you will need to be aware of the signs to make sure the problem is solved in time. When you notice any signs of a potential leak, contact our plumbing team for an inspection and the most cost-effective method of repair. We will pinpoint the precise location of the leak so that proper repair work can begin. A slab leak can cause severe property damage. Do you suspect one in your home? If you notice hot spots, unexpectedly high water bills, or other problems that point to a leak, call us right away at (410) 268-7191 and we will carry out a plan of action to return your home’s plumbing system to normal.